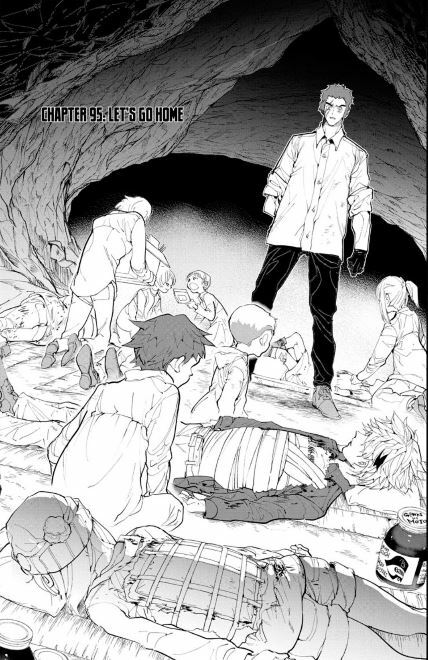 The Promised Neverland Recap – Chapter 95 – AiPT! The kids escape from Goldy Pond. Welcome to AiPT’s weekly The Promised Neverland recap column. As new chapters are released, I’ll be sharing my reactions to the series’s latest twists and turns. From bloodthirsty demons to elaborate battle strategies, writer Kaiu Shirai and artist Posuka Demizu always have something compelling up their sleeves. Be warned, though, that in order to elaborate on my thoughts I will be including SPOILERS. The central figure of this week’s chapter is Lucas, and it’s nice to see him get some time in the spotlight. The chapter kicks off with Oliver’s request that Lucas leave him and the other wounded children behind, and this is followed up by flashbacks of the Goldy Pond crew’s time together. We see Lucas enlist the children’s aid in his quest to destroy the hunting ground, and we get insight into his complicated feelings about doing so. These characters haven’t received much development prior to this, so it’s nice to see Shirai and Demizu dive into their emotional histories. It’s this added history and context that help make Lucas more interesting than ever before. We get to see him as a father figure to the Goldy Pond kids, both from their point-of-view and his. Lucas refuses to leave his young charges behind, but his reasoning is less straightforward than expected. Not only does he want to protect them, but he also feels as if he took advantage of their trust in order to distract himself from his own dire predicament. All parties involved here clearly care deeply for one another, which is touching. With that said, internal conflicts provide great character exploration. Lucas is much more compelling as a self-doubting hero than he would be as a completely selfless figure. As far as the rest of this chapter’s plot goes, we finally get a glimpse of the remaining demons at Lord Bayon’s mansion. Little do they know what’s coming–Ray and co. flood the camp, and it is awesome. It’s also a subversion of expectations. The heroes activate a self-destruction protocol for William Minerva’s hidden headquarters, which would usually entail explosions, but instead we get destruction by water. The chapter ends with a beautiful two-page-spread of the submerged hunting grounds, and it’s a great example of Demizu’s ability to pack small details into architecture. Perhaps the most pivotal exchange in this installment is between Ray and the Nameless Geezer. Ray entrusts the Geezer with the task of saving Emma’s life, and of doing so in a situation where no one else will be around to monitor his actions. This is quite a large amount of trust to extend to someone who had openly planned to kill Emma not too long ago. It’s a testament to Shirai and Demizu’s skill that Ray’s decision doesnt come off as naive. Like many of the other characters, the Geezer has been significantly changed by the events at Goldy Pond. I’m looking forward to seeing how he continues to blossom in the chapters ahead. Perhaps he might even grow to trust his allies enough to cease being nameless. That’s all for this chapter! Stay tuned for more recaps as The Promised Neverland updates every week. If you’re interested in reading more of our thoughts about the series, check out our column from last week, as well as our review of the latest collected volume. Also, feel free to share your thoughts about this chapter in the comments below!